Greenfield, IN (October 23, 2018) VRI — They started the day with four sewing machines and high hopes. Some 20 members of the Hancock County Extension Homemakers came together Saturday for an annual effort they call Make a Difference Day, which is dedicated to helping area veterans. Members of the county organization, which is dedicated to strengthening families through continuing education, leadership development and community support, donated fleece blankets and scrap fleece from their own fabric stashes to make soft, warm blankets with storage pockets, which can be used for whatever items the veteran needs to keep on hand, whether it’s the TV remote or medications, said president Deb Sweet. This year’s event also collected nonperishable food for Thanksgiving dinners that will be distributed by the members later this year, Sweet said. 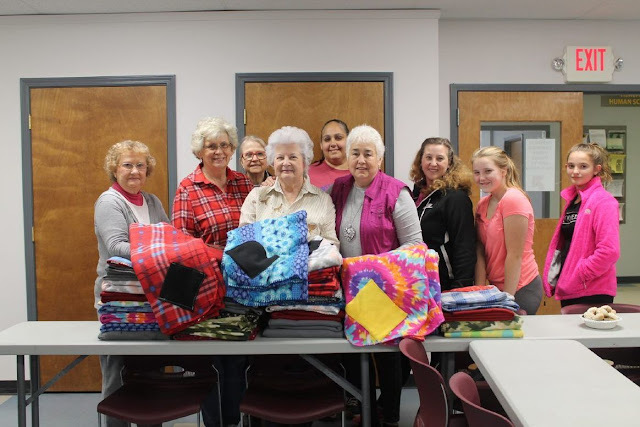 Despite technical difficulties leaving the homemakers with just two working machines by the end of the day, the group still managed to complete about 50 pocketed blankets. “It’ll help them keep warm if they’re in a wheelchair,” she said. “It’s a little way for us to say thank you for their service to the community.” The group worked from 9 a.m. Saturday to about 3 p.m., and by the end, those behind the sewing machines were taking no chances, talking nicely to their machines to encourage them to cross the finish line of 50 blankets. Homemakers members will deliver the items to the Roudebush VA Medical Center in Indianapolis as well as the Indiana Veterans’ Home, Sweet said. Meanwhile, the group will continue to collect Thanksgiving side dishes until Nov. 16, she said. The members will create baskets with all the sides to make a full Thanksgiving dinner and work with veterans service officer Bob Workman to find the veterans and families in the most need and provide them with turkeys as well as sides, Sweet said. On Nov. 17, the Homemakers’ members will distribute the holiday food items at the Hancock County Food Pantry, said Brigitte Raven, the group’s chairman of volunteer community support. The Make a Difference day is one of several annual efforts the group makes to help the community, including the annual holiday bazaar slated for 9 a.m. to 3 p.m. Nov. 3 at the Hancock County 4-H Fairgrounds, 620 Apple St., where dozens of vendors offer their best handmade holiday gifts and the homemakers provide breakfast and lunch options. Homemakers also host I CAN classes in the coming weeks at Park Chapel Christian Church, 1175 E. McKenzie Road. Classes are held Monday nights from 6:30 to 8:30 p.m. and include “How to Feed My Family of Four for $125 a Week or Less,” on Oct. 29, with recipes demonstrated and a free cookbook with recipes for participants; “How to Make Three Meals and a Soup from a Rotisserie Chicken,” Nov. 5, with participants sampling the recipes and provided with take-home recipes; and “How to Make Homemade Bread” Nov. 12, with participants taking home a recipe, a mixing bowl and a spoon.